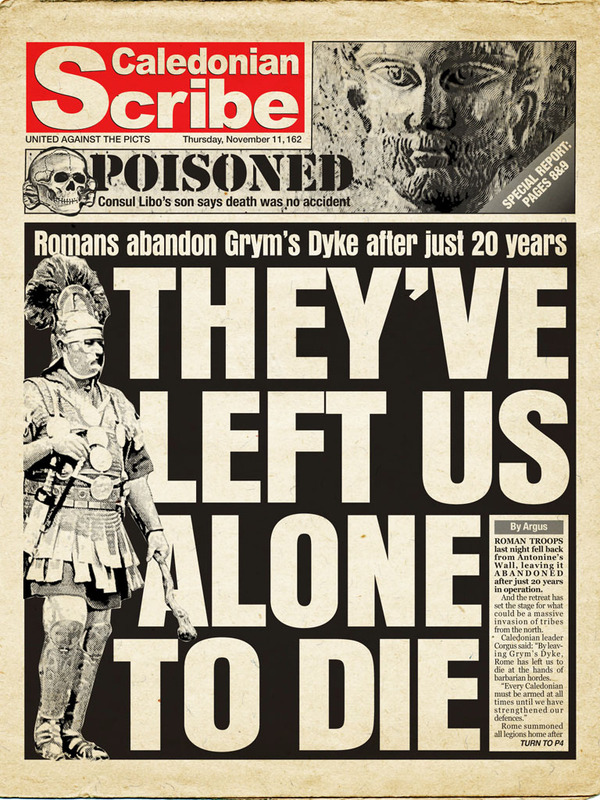 Old The Front Page presents some of the biggest events in the nation’s timeline presented as they would have been covered if a paper like the Scottish Scribe had been published from Roman times right up to the modern era. 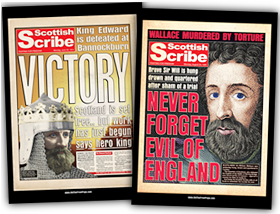 If the Scribe had really existed how would it have reported the rise of Bonnie Prince Charlie and the end of the Jacobite dream at Culloden? The death of William Wallace and Bruce’s victory at Bannockburn? Rabbie Burns, Saint Columba and the Loch Ness Monster, the Massacre of Glencoe, Mary Queen of Scots… Greyfriars Bobby? It took 20 years to build and cut Scotland in two with its 35-mile length across the central belt, representing the northern perimeter of the empire. But just two decades years later it had been abandoned, as troops were required elsewhere. Those living under its protection might easily have felt abandoned, although many would have welcomed the move. It was almost certainly re-used before the Romans finally left for ever. But recent investigation suggests there were more temporary guard walls further north in Scotland, and built later –meaning the empire didn’t necessarily stop at its self-built boundary. Consul Marcus Annius Libo died suddenly in mysterious circumstances while in Syria with joint emperors Marcus Aurelius and Lucius Verus. It’s suspected he may have been a victim of the rising resentment between the Roman leaders.